Small Block Chevy Stainless Steel Roller Rockers. 1.60 Ratio, 3/8 Stud. Maximum Race Series Stainless Steel Rockers. Made from high strength 15-5PH stainless steel, each piece is precision CNC machined and finished by hand to ensure that our customers receive the very best KMJ has to offer. ARC stud mount steel rockers are specially machined to allow for larger springs and retainers with full-cage friction reducing needle bearings for added durability. The nose rollers and shafts are Cr40 steel, heat-treated and hardened to minimize the wear that naturally occurs between the roller tip and the valve stem. All ARC stainless steel rockers come complete with poly locks at no additional cost. Designed to meet the demands of most high-lift roller camshaft profiles. Specially machined to accommodate larger valve springs and retainers. SAE-52100 Full complement precision needle and cage roller bearings. CNC machined pushrod cups and heat-treated Cr40 roller tips. Internal oiling system for long lasting performance. Clears most centerbolt covers (depending on the inside of the cover). CHEVROLET Small Block Gen I. ARC Maximum Race Series Rockers. 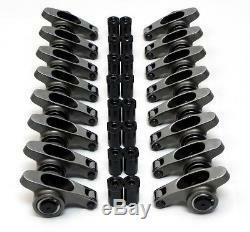 Check out the quality on these rocker arms. We've put together a comparison below, with our rocker arms on the left and our competitors on the right. Take note of the poor casting quality, inconsistent wall thickness, and weak press-fit roller pin. Above is our packaging with a reusable tray. To prevent any delays with your order you should watch for the following common issues. Addresses that only have a PO Box can cause long delays and almost always result with having to credit/cancel the order in the end. If the ord er requires multiple packages someone will need to sign for each one. Some items are not combined due to size or weight such as crankshafts, torque converters, radiators, cylinder heads, etc. Powered by SixBit's eCommerce Solution. The item "SBC Small Block Chevy 327 350 400 Stainless Roller Rocker Arms 1.6 Ratio 3/8" is in sale since Thursday, March 24, 2011.